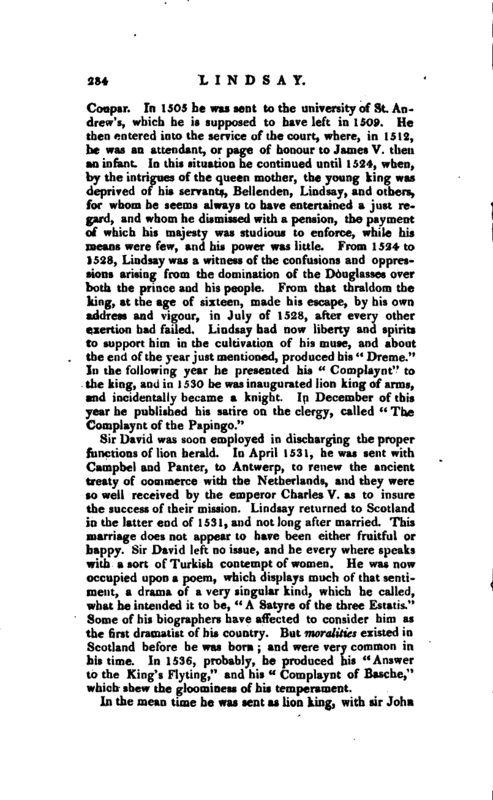 Sir David was soon employed in discharging the proper functions of lion herald. In April 1531, he was sent with Campbel and Panter, to Antwerp, to renew the ancient treaty of commerce with the Netherlands, and they were so well received by the emperor Charles V. as to insure the success of their mission. 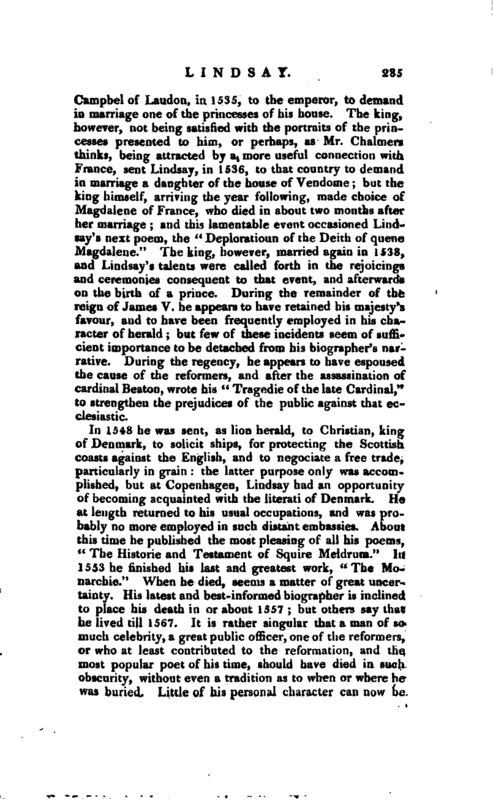 Lindsay returned to Scotland in the latter end of 1531, and not long after married. This marriage does not appear to have been either fruitful or happy. Sir David left no issue, and he every where speaks with a sort of Turkish contempt of women. 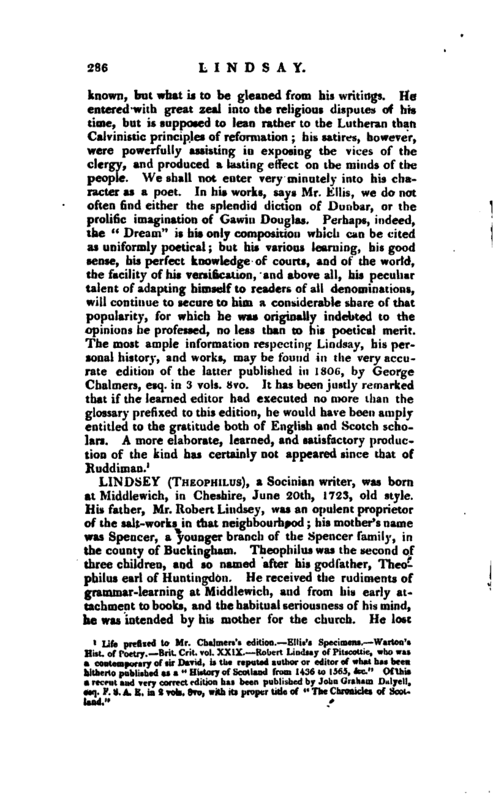 He was now occupied upon a poem, which displays much of that sentiment, a drama of a very singular kind, which he called, what he intended it to be, “A Satyre of the three Estatis.” Some of his biographers have affected to consider him as the first dramatist of his country. But moralities existed in Scotland before he was born; and were very common in his time. In 1536, probably, he produced his “Answer to the King’s Flyting,” and his ' Complaynt of Basche," which shew the gloominess of his temperament. In the mean time he was sent as lion king, with sir John | Campbel of Laudon, in 1535, to the emperor, to demand in marriage one of the princesses of his house. The king, however, not being satisfied with the portraits of the princesses presented to him, or perhaps, as Mr. Chalmers thinks, being attracted by a more useful connection with France, sent Lindsay, in 1536, to that country to demand in marriage a daughter of the house of Vendome; but the king himself, arriving the year following, made choice of Magdalene of France, who died in about two months after her marriage; and this lamentable event occasioned Lindsay’s next poem, the “Deploratioun of the Deith of quene Magdalene.” The king, however, married again in 1538, and Lindsay’s talents were called forth in the rejoicings and ceremonies consequent to that event, and afterwards on the birth of a prince. During the remainder of the reign of James V. he appears to have retained his majesty’s favour, and to have been frequently employed in his character of herald; but few of these incidents seem of sufficient importance to be detached from his biographer’s narrative. 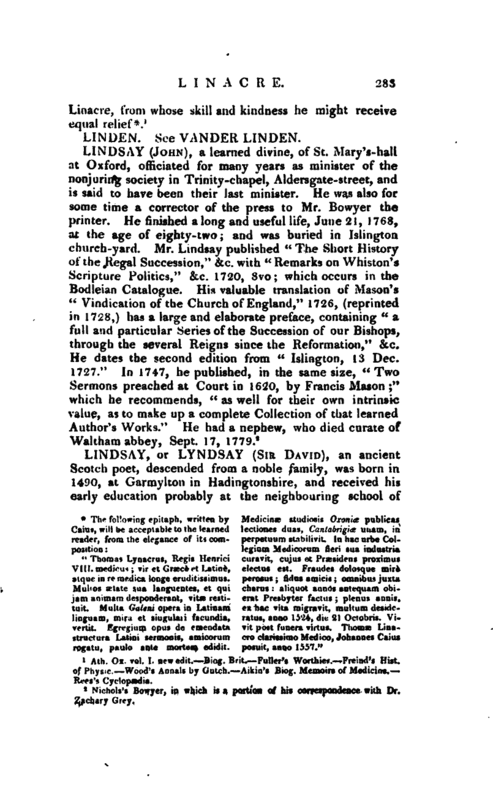 During the regency, he appears to have espoused the cause of the reformers, and after the assassination of cardinal Beaton, wrote his “Tragedie of the late Cardinal,” to strengthen the prejudices of the public against that ecclesiastic.